I've been slacking. On blog posting and taco eating. I'm embarrassed to even boast that I have a blog about taco-ish things. Today I received an email. 3 Taco Shops to know. I know 1. Empellon al Pastor opened recently and comes from the amazing line of Empellon Taqueria and Empellon Cocina. I know it, but I've never been. And the others? Maybe I have heard them mentioned once before, but really they all sounded pretty new. And I call myself a taco blogger. Sheesh. Well, clearly this needs to be remedied in the upcoming months and what better way to spend my November and December than eating tacos? I usually have multiple tabs in multiple windows open on Chrome. I find it really frustrating to click back and forth between the windows. Today I reach for Alt + Tab to switch from Chrome to Microsoft Word and given that my fingers were a bit lazy, I discovered Command and ~. I switched between Chrome windows! Today I found an infographic about Tacos. It's pretty awesome. 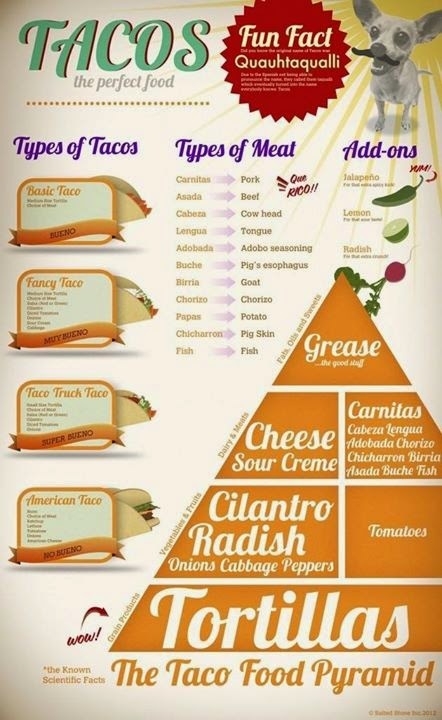 Thanks to fitsme for enlightening me with this Taco Food Pyramid.